First introduced in 2001, the Kalpa - with its tonneau case, teardrop lugs and understated dial with Delta-shaped hands - is one of the most recognizable Parmigiani Fleurier collections. Ahead of the upcoming SIHH event, the brand unveils three initial interpretations of the line revamping: the Kalpagraphe Chronomètre, Kalpa Chronor and Kalpa Hebdomadaire men’s models. The distinctive tonneau shape of the case is based on the first shaped wristwatch movement developed by Fleurier’s master watchmaker back in 1998. Its profile and nicely integrated teardrop-shaped lugs are inspired by the golden ratio’s logarithmic spiral that can be found in nature. The name of the watch remarks this connection. In fact, the Kalpa word refers to cosmic order, ritual and art, through which man achieves harmony with universal energy. In an effort to offer the highest consistency between the outside and the inside of the watch, the new-generation Kalpa now comes exclusively with shaped calibres, specially developed in-house. This way, the movements integrate precisely with the outlines of the tonneau cases. 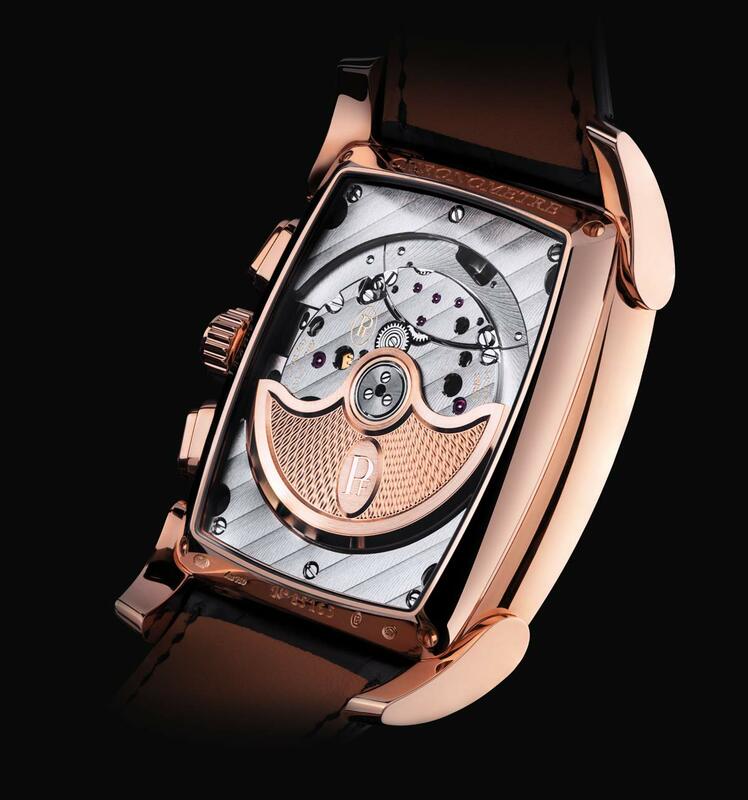 Each of the three new men’s Kalpa models unveiled for SIHH has a previously unseen tonneau movement, manufactured entirely in-house: the calibres PF362, PF365 (in solid gold) and PF110. The first two are automatic movements with an integrated chronograph, and the third is a hand-wound calibre with an eight-day power reserve, modelled on its 1998 predecessor; all three are COSC-certified. On the outside, the tonneau case, known for its ergonomic design that sits comfortably on the wrist, has had its outline and curves reworked. A slight concavity adds character to the overall appearance while the teardrop lugs have been resized and realigned, to better fit with the case. The crown has been enlarged. The new dials have been designed with clarity and refinement in mind, with different levels of surfaces and finishes, alternating between guilloché, snailing and opaline work punctuated with hand-applied faceted indices. The delta-shaped hands have been resized and given a luminescent coating. To further increase the readability of the functions, the date window has been moved away from the small second display and placed at the top of the dial. The Kalpagraphe Chronomètre (ref. PFC193-1002500-HA3242) combines the rose gold of the case with the deep Abyss blue of the dial. 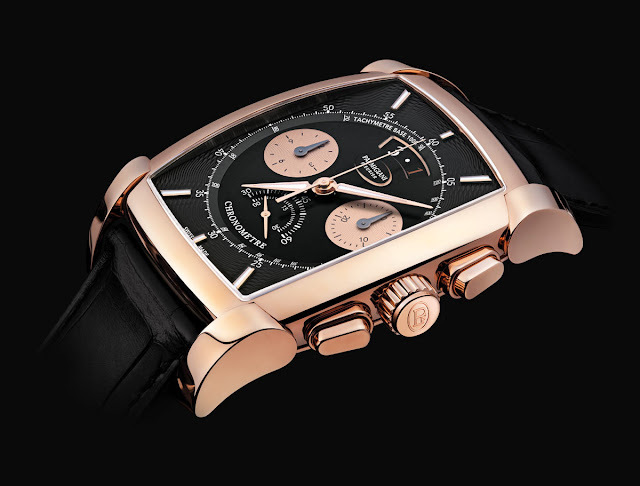 It is powered by the Parmigiani Fleurier calibre PF362, a self-winding, integrated chronograph offering hour, minute, small second and chronograph functions as well as a tachymeter scale and date display, with a 65-hour power reserve. 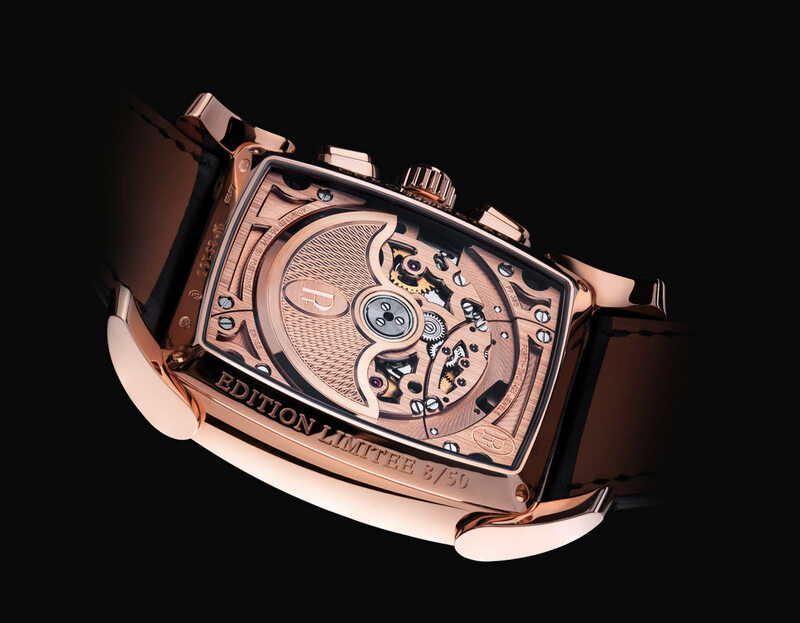 Entirely developed and manufactured in-house over a period of six years, this calibre works at a frequency of 36,000 vibrations per hour (5 Hz) and demonstrates an accuracy of one tenth of a second; it also features a column wheel and vertical clutch to ensure accuracy and user comfort. In addition, its variable-inertia balance is secured by a bridge which provides strength and stability against shocks. Seamlessly integrated with the hand-polished 48.2 x 40.4 mm tonneau case, this advanced mechanism reveals, through the sapphire case-back, the elegant finish and the 22 ct gold oscillating weight with its barley grain guilloché motif. The dial is divided into different levels and features an opaline finish for the centre, a radial guilloché-worked flange punctuated with hand-applied faceted indices, two snailed counters enclosed within a fine gold edging, an angled tachymeter scale, a semi-instantaneous date window, and a small seconds sector with its own hand. The luminescent Delta-shaped hands, the counters placed slightly off-centre, and the rounded date indicator containing three numerals come together to form a balanced display. The Kalpa Chronor (ref. PFH187-1001400-HA1442) features the world’s first solid-gold, self-winding, integrated chronograph movement. Made of hand polished 18 ct rose gold, the case measures 48.2 x 40.4 mm and houses the COSC-certified calibre PF365 oscillating at the high frequency of 36,000 vibrations per hour (5 Hz) to achieve a reading accuracy of one tenth of a second and offering 65 hours of power reserve. Offering a power reserve of around 65 hours, this Haute Horlogerie movement also features a variable-inertia balance, held in place by a crossthrough bridge, for improved stability and shock resistance. The wide sapphire crystal opening reveals the precious movement and its oscillating weight in 22 ct gold that features a barley grain guilloché motif. The 18 ct gold bipartite dial in black is finished with an opaline centre, hand-worked braid-effect guilloché detail on the flange, and snailed counters positioned slightly above the centre point for better readability. The Kalpa Chronor will be produced as a series of 50 numbered pieces. The third model unveiled for SIHH, the Kalpa Hebdomadaire (ref. PFC101-1001400-HA1441), pays tribute to the history of the Kalpa and the company’s first tonneau-shaped movement. 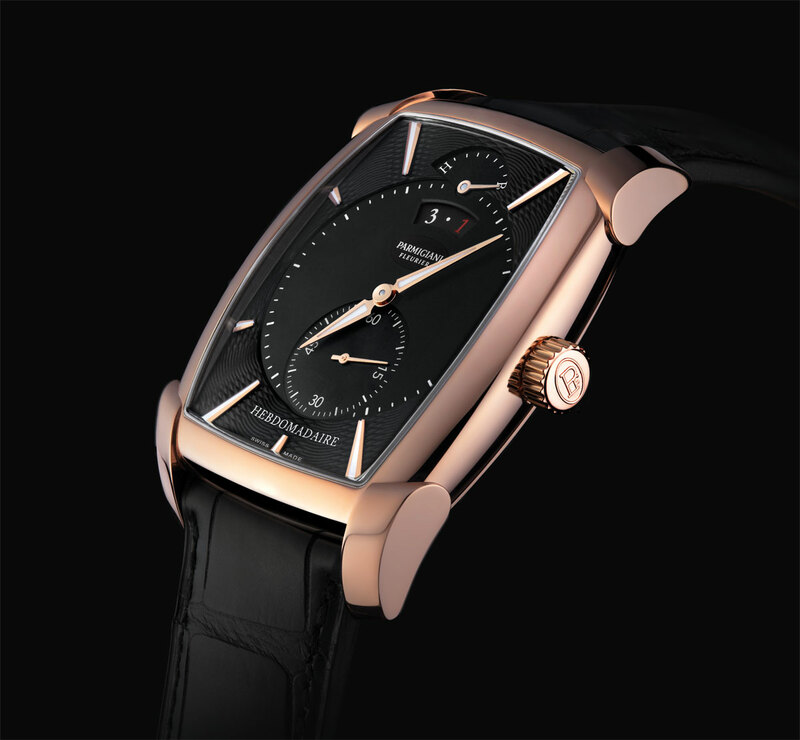 Developed by Michel Parmigiani in 1998 and honoured with an innovation award the following year, the hand-wound calibre PF110 is characterised by its remarkable eight-day power reserve, made possible by the two series mounted barrels. Beating at a frequency of 3 Hz (21,600 vph), this calibre offers hour and minute functions, small seconds at 6 o’clock, a date display and a weekly power reserve indicator. In keeping with the other new-generation Kalpa watches, the refined design features of its mechanism – ‘Côtes de Genève’ pattern, bevelled bridges and circular graining – are exposed through a sapphire case-back. Framed by the 42.3 x 32.1 mm rose gold case, the rich black dial is hinged on different levels and has an opaline finish in the centre, on the small seconds counter and on the power reserve scale, as well as a hand-worked braid-effect guilloché detail on the flange. The instantaneous date display at 12 o’clock houses the signature bright red ‘1’ numeral. Interesting lines but I would like to see how they sit on the wrist. We will handle the watches in few days at the Salon International de la Haute Horlogerie in Geneva (Jan 15-19). Make sure to follow our Instagram channel for some wristshots. Pre-SIHH 2018: Parmigiani Fleurier - New Kalpa. First introduced in 2001, the Kalpa - with its tonneau case, teardrop lugs and understated dial with Delta-shaped hands - is one of the most recognizable Parmigiani Fleurier collections. Ahead of the upcoming SIHH event, the brand unveils three initial interpretations of the line revamping: the Kalpagraphe Chronomètre, Kalpa Chronor and Kalpa Hebdomadaire men’s models. 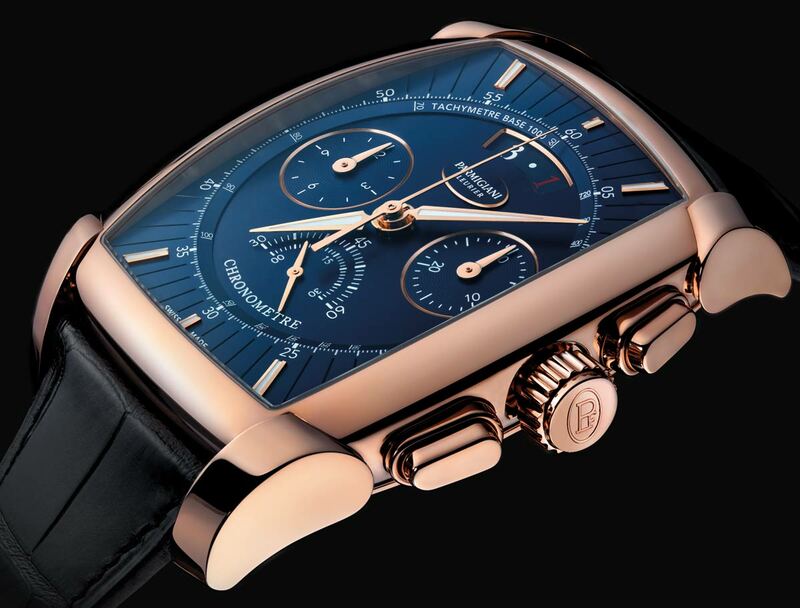 The new Kalpagraphe Chronomètre (ref. 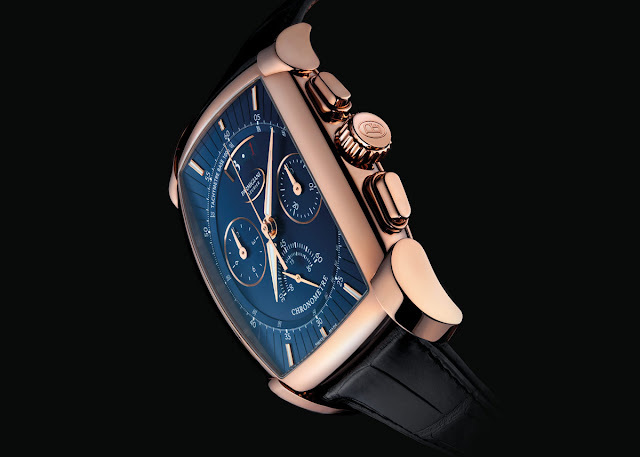 PFC193-1002500-HA3242) combines the rose gold of the case with the deep Abyss blue of the dial. The Kalpa Chronor (ref. PFH187-1001400-HA1442) features the world’s first solid-gold, self-winding, integrated chronograph movement. 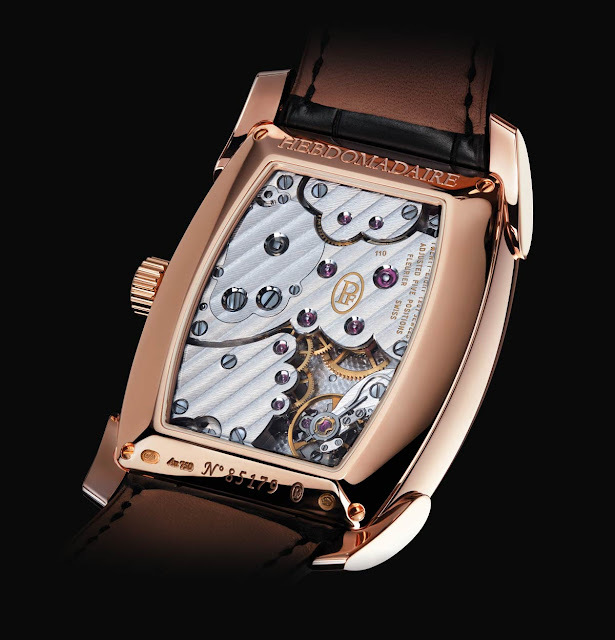 The third model unveiled for SIHH, the Kalpa Hebdomadaire (ref. PFC101-1001400-HA1441), pays tribute to the history of the Kalpa and the company’s first tonneau-shaped movement.